The items have been delivered to the Charity ‘Caritas of Lanzarote’. The NGO will distribute the collected items amongst the families who need it the most on the island. 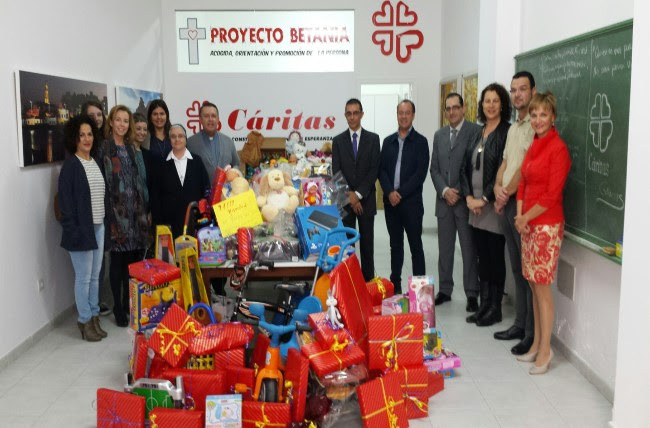 The Sustainable Accommodation Group, integrated into the Association of Hotels and Apartments (ASOLAN), has completed the third edition of the Toy Collection Campaign collecting 600 children’s items. They have been given to Caritas of Lanzarote. The NGO will distribute all collected items to the families who need it the most on the island. This activity, already consolidated, has been launched by about twenty accommodation establishments with the aim to spread joy amongst children during the holiday. “What we want this Christmas is for all children to have a gift under the tree,” said Susana Perez, president of the Patronal. Since last Friday the 4th and up to the 20th of December, the receptions of the hotels integrated in the Sustainable Accommodation Group, became the toy collection points. The campaign has involved both, staff and customers staying in the hotels. This year, expectations have been exceeded with considerable increased donations. Apartamentos Barcarola Club / Apartamentos Fariones / Apartamentos Nautilus Lanzarote / Apartamentos Relaxia Lanzaplaya / Apartamentos Relaxia Lanzasur Club/ Suite Hotel Fariones Playa/ Hotel Los Fariones/ Hotel Princesa Yaiza Hotel Resort/ Hotel Meliá Salinas/ Hotel Be live Family Lanzarote Resort/ Hotel Be live Grand Teguise PLaya/ Club La Santa/ Hotel H10 Lanzarote Gardens/ Hotel H10 Timanfaya Palace/ Hotel Boutique H10 Sentido White Suites/ Hotel Sands Beach Resort/ Hotel Sandos Papagayo Beach Resort/ Hotel Costa Calero Talaso&SPA/ Hotel Hipotels La Geria.